From our three insights into the new ways of managing, we created Teal Unicorn’s approach to driving transformation to new ways of working: the Unicorn Management Model. •	The improvement “paddle-wheel” model below. •	A four-tier growth model. •	An Improvement Machine model. •	A management development programme. The Unicorn Management Model is © Copyright Two Hills Ltd www.twohills.co.nz. We share it licensed under a Creative Commons Attribution-ShareAlike 3.0 Unported License. Please attributed content to "© Copyright Two Hills Ltd www.twohills.co.nz" plus the URL of the source material. Contact us. Distribution mechanism coming soon. Teal Unicorn provides consulting and training on new ways of working and managing, mostly in New Zealand and Vietnam, but no matter where you are, ask us. The Unicorn Management Model honours the principle that you can't change a complex system, you can only create the conditions for it to change itself. Management creates and manipulates those conditions. New Ways Of Managing also honours the Agile principle of "Let the people doing the work design the work". The system gives them the values, ways, and means, and lets the work be emergent. So long as the organisation is in an explore mode, you can do everything grassroots, below the rader, guerilla. But in order to move to "The New Way Of Managing For Our Organisation", you need executive support: a mandate to incubate that new way and adopt it widely in an iterative incremental manner. Trying to change the way people work is futile. They work within a system. The system must change in order to allow the people to change the way they work. The system provides them values to guide them, ways of working to shape what they do, and the means to do their work. The system is built on people's behaviour and culture, practices, artefacts and tools, and suppliers / partners. We change the system in order to change these inputs to the work. The way we change the system is by changing the way we manage the system. We do this in three primary areas: we change the people management, the governance and executive management, and the business management of the system. The executive management provides the policy, priorities, vision, strategy, and funding, which in turn sets the values that the people use when doing their work. We exclude leadership from this list: leadership comes from managers and non-managers alike. Not all managers are leaders. Leadership uses these same inputs, because leadership is part of the system to enable it. The executive are themselves directed and monitored by the organisational governance, who should be concerned primarily with three system resources: people, money, and information - which they should govern equally. The executive management receives feedback from the system, especially but not exclusively feedback on the risks present in the system, in order to allow them to manage risk. In order to change the way executive management and governance think, we coach both governance and executive management in the new principles guiding the way they manage. There are 10 primary principles that we use and a number of subsidiary principles derived from them. For example, these principles include the ideas that success comes through failure, we should organise around products not projects, we need to do less in order to do more, and let the people doing the work design the work. The people management function influences the system through KPIs, performance management, workflow definitions, and process designs. These shape the ways for people to do their work. People managers receive feedback from the system primarily around the performance of the work. The way that we influence people management is through introducing new models for behaviour, including kaizen cultural improvement, network management structures, servant manager (we don't like the term servant leader), agile management, and transformational leadership. The business management function provides resources, capability, tools, and architecture, which practitioners use as the means to do their work. The business management function receives feedback from the system primarily but not exclusively around what are the constraints in the system that management can help remove. To change the way business is managed we introduce new methods such as Lean, Theory of Constraints, value networks, Kanban, Scrum, Scaled Agile Framework or Disciplined Agile or Large-Scale Scrum or Scrum of Scrums, and DevOps. An improvement “machine” drives a continual improvement programme to keep the whole thing alive and moving. it makes the same point that improvement is outside the work itself. There are many principles we can derive from the thinking of Agile, Lean, DevOps and other bodies of knowledge. There is no template for any organisation – you must agree together which principles drive and guide your organisation. There are high-level abstract principles in the book. Here we provide some more-practical ones (also from the book). Check back - we update these. Last update 20190331. 	The customer determines what is valuable, whether we are doing the right things. Work must flow out to have value. 	We are all on the same side. 	Quality is everybody’s responsibility. 	Our people are adults, professionals, with good intentions. 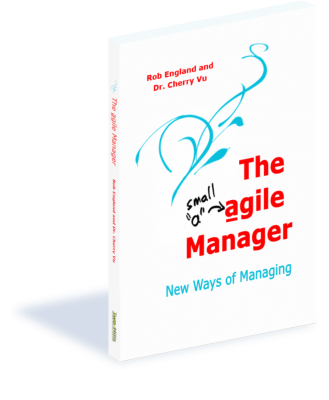 	Management exists to grow people and grow the system; to make work more agile; and to ensure maximum value is delivered to the customer. 	People flourish: they do well here, they blossom. We care about growth, engagement, and mental and physical health. It is better (and usually cheaper, and often just as fast) to grow somebody than to replace them. 	Whenever possible, we communicate face-to-face. 	We embrace diversity. Mixed groups make the best decisions. A collective view from a wide range of perspectives is the most valuable qualitative data. People differ in how quickly they change - we value conservatives. People aren’t positive and upbeat all the time. 	The answers lie where the work is done - go to the gemba often. 	Managers and governors go to the work to get their own data, and do their own reporting of what they observe. 	Collectively, we hold the solutions. External and internal experts provide knowledge and ideas; together we find the answers. 	Continual improvement is the way we do things around here. We are a learning organisation. 	It is more important to improve work than to do work. 	Ways of working are designed by those doing it. Change is pulled by them not pushed by the organisation. 	Failure is embraced as an asset of the organisation. We extract maximum value from failure. Failure makes us stronger. We don’t punish failure. We reward information about it. Failure is met with curiosity not controls. 	Fail well. Fail fast, early, small, often. Minimise blast radius. Be immaculate in what you do: only noble failure. 	Planning is essential but plans are expendable. Plan only enough. 	We navigate ambiguity. We don’t know the end when we start. We cope with imperfect information. 	The only way to know is to do. Opinions are interesting, but validating the hypothesis at minimum cost and risk is much more useful. 	Agility is about how fast you can change how you work, not how fast you work. 	We are holistic, we understand and improve the system. 	Agility, velocity, and efficiency are outcomes from quality in what we produce and how we work: focus on lifting quality. 	Shift left: ensure quality as early as possible, as integral to the work as possible. 	Work is sustainable indefinitely without accruing cultural or system debt. 	Maximum throughput does not come at maximum utilisation of resources or people. There must be slack capacity. Applying the Improvement Kata, what's your vision for New Ways of Working and Managing? What are the far-term goals? As explained in the book, we call these navigational stars “matariki”. Check back - we update these. Last update 20190331. ★	Value is measured by what is delivered to customers. ★	The Voice of the Customer is present in all decisions. ★	Teams work together focused on the customer value. ★	Cultural debt and system debt are falling. Out of hours work is exceptional, never normal. ★	All important communication is face-to-face. ★	Managers are servant managers. The hierarchy supports the work, management is a foundation not an overhead. ★	People want to work here. We get all the good people we need. ★	Teams are stable and long lived. ★	We work in networked ways: we create connections, our communities cut across silos, we are fluid, we come together in virtual teams, we swarm to get stuff done. ★	When we want to find out, we go to the gemba: performance, status, design of work, feedback, morale… Management do reporting. ★	Controls are as light as possible, as early as possible, parallel where possible, and incremental. All non-value functions are focused on getting out of the way of the value flow. ★	Information flows freely and widely. Feedback loops are strong and fast. ★	All work is visible. ★	Productivity (velocity through quality) always increases. ★	All culture and operating models are based on a foundation of continual improvement. ★	Everybody works in cadenced iterations. ★	Experimentation is how we work. All iterations are an experiment. We re-plan often based on what we learn. ★	We are organised and architected to minimise dependencies between teams. We align and manage the remaining dependencies with minimum surprises. ★	All teams are small (<10) and self-organising. ★	The organisational structure is pulled by the teams not pushed by the management. It usually happens incrementally, not in big reorganisations. ★	We optimise whole value streams, not local activities. ★	Quality is built into the work systems, as early as possible. ★	Value streams are run at maximum throughput not maximum capacity. We understand that people are not utilised 100% (or more). ★	Teams pull from a single stream of work. ★	Work is prioritised by those owning the value produced. ★	Work is broken down small enough to get done. We scale work down, not teams up. ★	We build our organisation around products not projects. Projects are a logistic construct to manage large scale work, not an organisational structure or a work structure. ★	Our systems are built to expect human error, to be resilient in failure, and to respond to stress by improving. ★	We balance the efficiency of standardisation and automation with the agility of diversity and human work. We can change the way we work quickly. 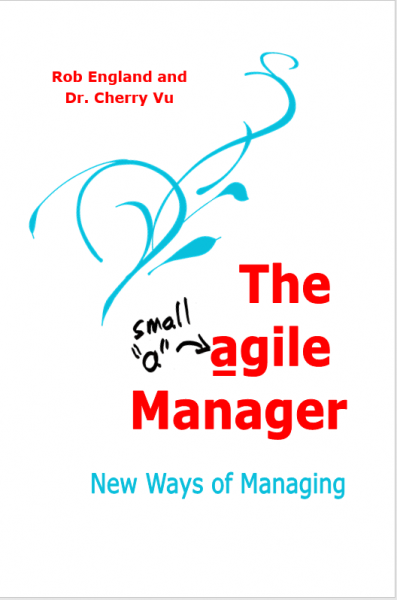 For more on this, see our new book, The agile Manager.